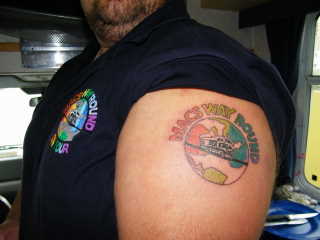 "WE MADE IT - 1 YEAR ON MACSWAYROUND-SO FAR.........!!" ‘Kia Ora – Macswayround check in again - from the Land of the Long White Cloud!’ At Whakatane we enjoyed another bush walk in the novelty of a Kiwi protected territory. There were some Pohutukawa Trees in and around this town and these have become known as the New Zealand Christmas tree - as they have a beautiful crimson bloom throughout each Christmas season. 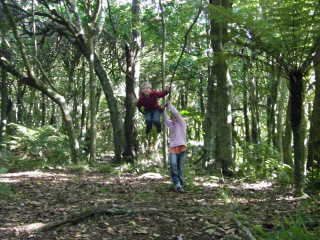 These trees also hold special Cultural Significance and tradition to the Maori people. 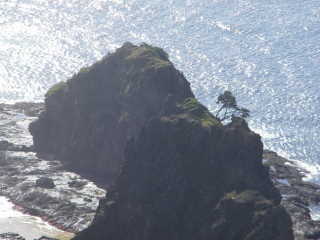 Off the coast at Whatakane lies the moonscape island named ‘White Island’. This happens to be New Zealand’s most active volcano! On the way to the Coromandel and Hot Water Beach, we stopped off in a place called Bethlehem – for a fix of cream cakes! 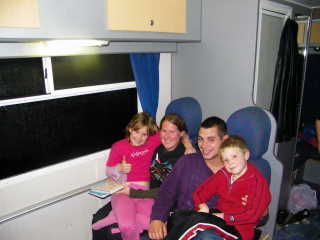 The weather was a little wet – and we got stuck for a day as flooding prevented our onward journey! 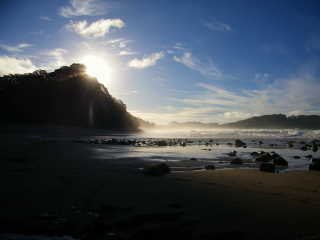 However – we stayed at a brand new site just a stone’s throw from the Hot Water Beach and received a very warm welcome. 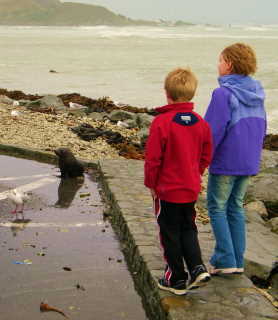 The beach was a fantastic novelty – come rain or shine! We all enjoyed digging holes for our feet in the sand and making use of the natural bubbling hot spring beneath the sand – to heat our feet up! This beach is included in the top ten beaches in the world, although it is best to stick with digging a hole in the sand rather than swimming, as the beach is also within the 4 most dangerous for rip tides in New Zealand. Nearby the beach at Hahei has beautiful white sand and we also walked along to see Cathedral Cove which is included in the film setting for ‘Chronicles of Narnia – Prince Caspian’ –the C S Lewis classic movie. We took an early morning dip in the hot pool at Miranda campsite to catch a romantic sunrise – unfortunately lost to the clouds! Ten out of Ten for effort though! At Birkenhead, in Auckland, we caught up with my cousin Neil, his wife Heather and boys – Max and Toby – some more long lost cousins for Jemma and Ben! 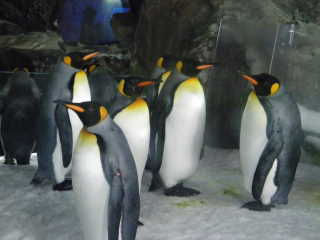 At Kelly Tarlton’s Antarctic Encounter – Underwater World and Aquatic Discovery (in Auckland) – we definitely got our PENGUIN FIX!! We were pleased to see massive stingrays, sharks and lots of other fish - as well as New Zealand’s only Sub-Antarctic Penguins – YES – mission accomplished!! 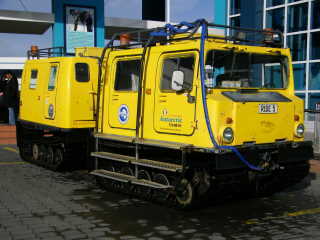 Here, we were able to ride a snow cat through the largest underground colony of Sub-Antarctic penguins - in the world! We loved watching the King and Gentoo penguins as they played in the snow and even went around on the snow cat for a second helping! This centre also has a life-sized replica of Captain Robert Scott’s Antarctic hut and tells the story of the conditions that he and his team lived within during their exhibitions to the world’s coldest continent. 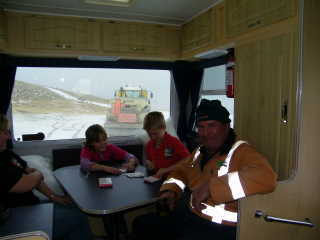 Thank -you to Neil, Heather, Toby and Max for accompanying us on a great day out and for the use of their house! We ventured further north and our journey took us through Waiwera where we enjoyed the movie pool and slides at the Infinity Thermal Spa Resort. 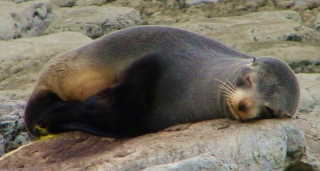 At Goat Island, the Marine Reserve was New Zealand’s first of its kind and enormous fish could be seen from the rocks along the coast line, through the clear waters. We found out that this island has never been home to a goat – although it did have pigs – until they decided to swim ashore! 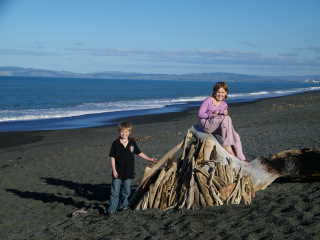 We stayed at Pakiri Beach on the way to Russell, in the Bay of Islands. 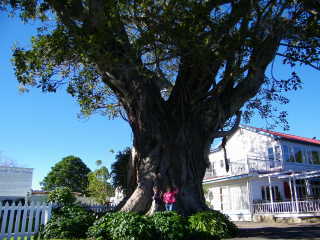 Russell has many fine old buildings, an old fig tree and a lovely waterfront. 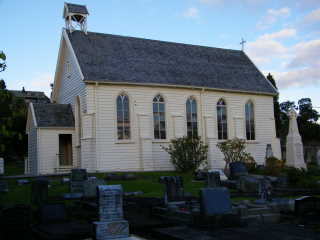 It is also home to Christchurch – New Zealand’s oldest church (1847), which is still scarred with musket holes today. Charles Darwin made a contribution towards the cost of building this church. We all had a fantastic three hour boat cruise, leaving from the Russell waterfront. 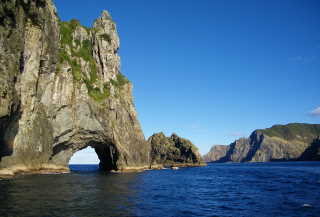 We toured around some of the islands and sailed through the infamous ‘hole in the rock’. 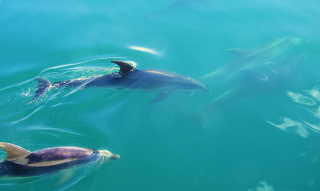 The highlight of the day has to be the most amazing sight of a pod of large Bottle nosed dolphins, as they swam around our boat!! 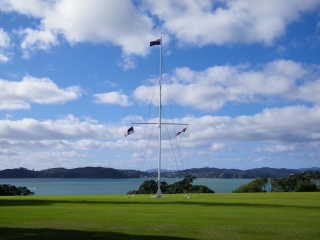 A small ferry trip took us towards Waitangi –the most important historic site in New Zealand. It was here that the Waitangi Treaty was signed by a large number of Maori chiefs and the British Crown in February 1840. 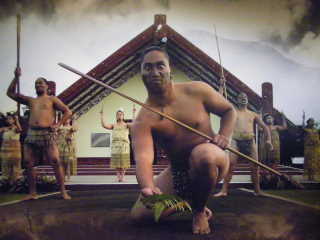 The Treaty saw Maori cede sovereignty to the British Queen, affording them the rights of all British subjects in return. The Treaty then toured the country and by September it had been signed by 500 chiefs. This remains a cornerstone of New Zealand’s foundation today. The Treaty grounds is now home to the renovated Treaty house, a museum, a marae, a 35 metre Waka (war canoe), and the UK, NZ and Maori flag pole which marks the spot where the Treaty was signed. We also enjoyed our first cultural experience, where Phil was chosen as Chief to represent our group of visitors and had to be welcomed in the traditional manner and accept a fern leaf from the warriors. Phil was also greeted on behalf of the group with the traditional Hongi and then Ben joined him with the other men to perform a Haka! Jemma and I took to the stage later to join in with a traditional Poi. 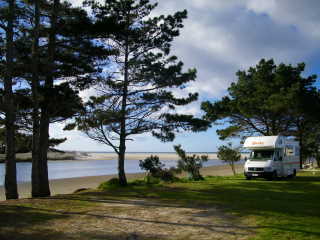 We stayed at The Park - Top Ten by Ninety Mile Beach. 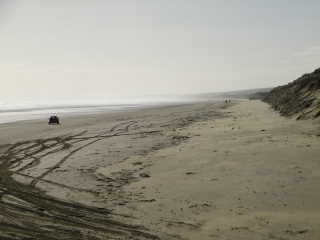 This beach is actually 52 miles long and often serves as a secondary highway for vehicles heading north. 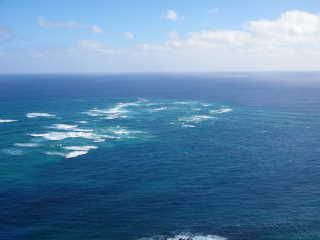 We drove by road to the top of the Aupouri Peninsula – Cape Reinga – which is the most northern point of New Zealand. 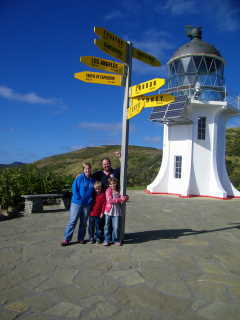 The Cape Reinga lighthouse is right at the end of the path and has an ‘end of the world’ feel to it. It really is a most beautiful place and has the added force as it is here that the Tasman Sea meets the Pacific Ocean.......at the Columbia Bank Maelstrom. 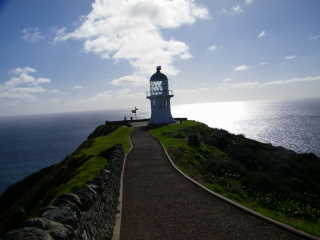 Cape Reinga is a place of intense cultural and spiritual significance to Maori. According to Maori legend the Pohutukawa tree at this point (approximately 800 years old), marks the place where the spirits of the dead begin their journey back to the home of their ancestors. 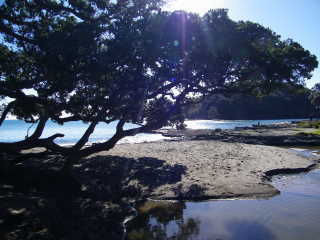 It is believed that the soles of the departed climb down the roots of this tree and swim north to Hawaiki and back to their eternal home. 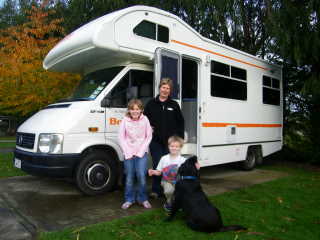 For us – it meant that we had made it from Bluff at the south of the south island to the very north of the north island! 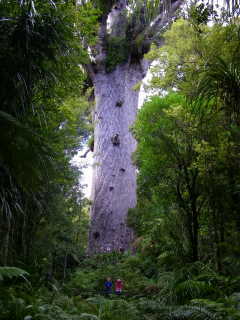 On the way to Matakohe we drove alongside the Waipoua forest on the west coast and saw the biggest Kauri tree in the world – at around 2000 years old the Tane Mahuta (Lord of the Forest) certainly lives up to the name. 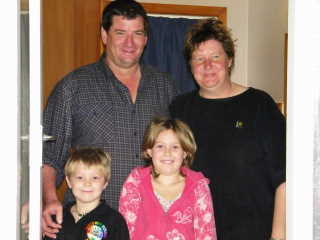 We were pleased to accept an invitation to call into a farm near Putaruru and catch up with some friends that we first met in Invercargill! 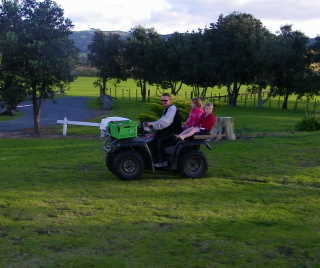 Steve and Eileen made us all very welcome and we enjoyed a guided tour of the extremely modern farm. The milking parlour can hold 50 cows on a massive turntable and these cows can all be milked within 7 minutes! 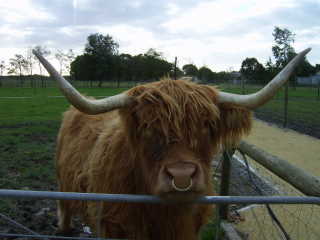 They can hold 650 cows in the round yard, at any one time. We thank them for their hospitality and would like to return the favour back in the UK – one day! 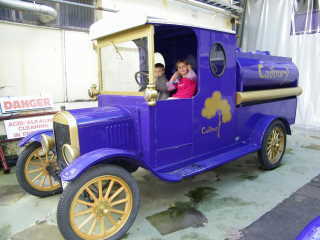 Rotorua was next and we all had great fun at the Skyline rides, gondoliers and the Luge – in the rain! 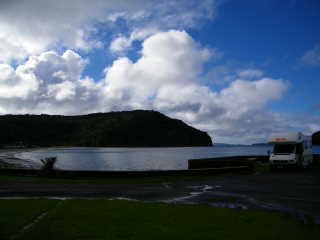 Rotorua has an aroma all of its own which can take some getting used to! The Sulphur city gives an insight into what is happening beneath the earth’s crust. We visited Te Puia which is the largest and best-known thermal reserve and was excellent as it also doubled up as a major cultural area. We enjoyed spurting geysers, steaming hot springs and exploding mud pools! 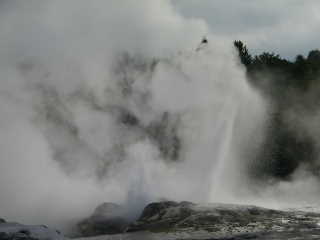 There are two main geysers, named the Prince of Wales’ Feathers and Pohutu (big splash or explosion). 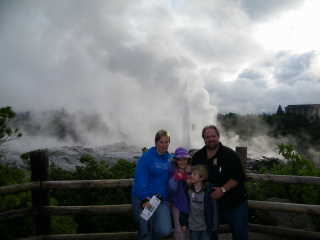 These geysers erupted several times during our visit and produced the most extraordinary spectacle. The Pohutu geyser can spurt water to an impressive height of 30 metres into the air! We had a great guide who took us on a very informed tour of the whole site and we thoroughly enjoyed another cultural performance in the meeting house. 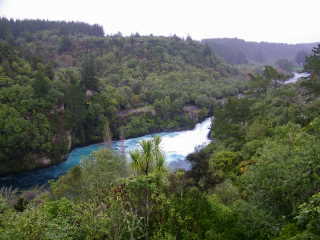 As we headed south from Rotorua, the Huka Falls were very scenic with beautiful turquoise water. Through Lake Taupo and along the Tongariro National Park we drove the desert road and were mesmerised by the active volcanoes on either side of the road. 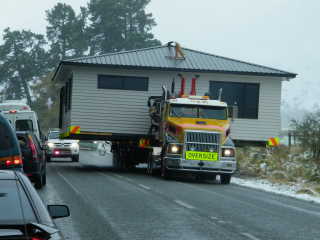 We stayed at Ohakune which is also the gateway to the majestic mountains of the central volcanic plateau! 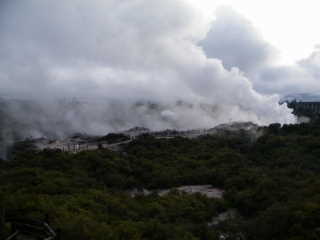 As steam rose through these thermal landscapes from every direction – we had another extraordinary feeling -as if these islands are on a living time bomb.There are many earthquakes throughout New Zealand, on a very regular basis, and we had 4 of them in our local area, all within one night! 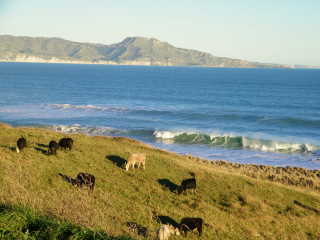 Our last stop off before Wellington, was at Papaparaumu- where we did our final bit of packing. 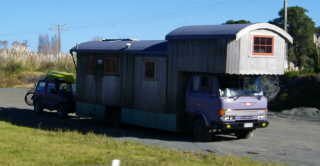 The camper will be delivered back to Wellington Top Ten and then we leave New Zealand to fly back to Los Angeles, USA (via Sydney airport) on 1st July 2009! 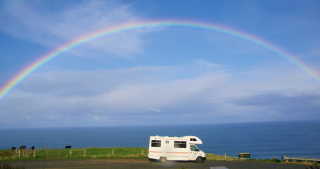 So as we say farewell to this volcanic country of natural wonder - we are off to find the sunshine and are all greatly looking forward to being re-united with our own camper – NESSIE!! FACTOIDS: •	The Maori people are descended from an ancient line of Polynesian people who made their epic journeys in waka hourua (voyaging canoes) from an ancestral homeland known as Hawaiki. 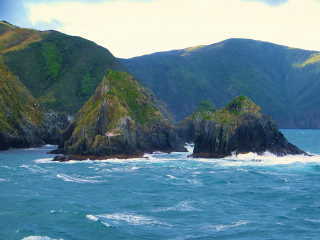 Kupe is believed to be the first Maori to reach the New Zealand shore over 1,000 years ago. 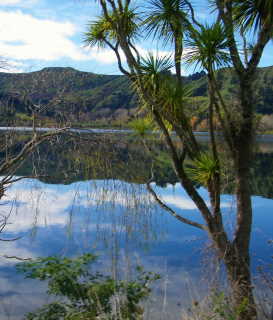 Northland is regarded as the birthplace of the nation. 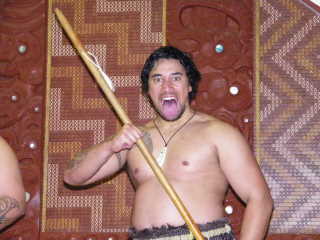 •	Today – approximately 14% of the New Zealand population are Maori. 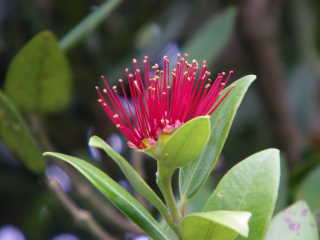 •	The Pohutukawa Tree is now a threatened species as it is no longer able to regenerate itself due to the competition from weeds and grasses. 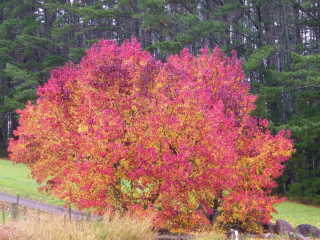 These factors, together with the added threat from disease and pests such as possums, are causing great concern for a tree that has become symbolic to New Zealand. •	The Hot Water Beach is created by a reservoir of hot water and heated rocks which lies more than 2 kilometres beneath the sand. 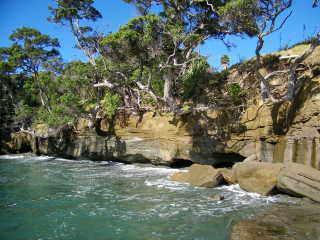 The heat is a remnant of volcanic activity which occurred in the Coromandel region 5-9 million years ago. There are two springs and they can reach maximum temperatures of 60 degrees C and 64 degrees C, respectively. They have a flow rate of 10-15 litres per minute. 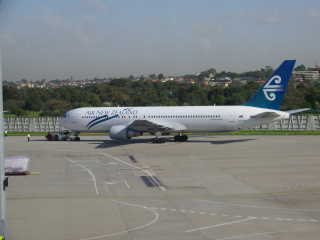 •	As a nation, New Zealand embraces the Maori element of its culture and in recent times there has been resurgence in the use of the Maori language and culture. 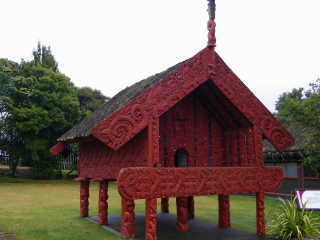 •	The MARAE, or meeting place, is a central part of Maori culture. The traditional arts of weaving and carving are incorporated in intricate panels which reflect the story of their significant people. •	The HONGI is a traditional Maori greeting. Noses are pressed together and the Ha, or breath of life, is exchanged and intermingled. The Hongi is an integral part of the Powhiri (welcoming ceremony). •	MOKO – is the traditional Maori tattooing on the face or body. 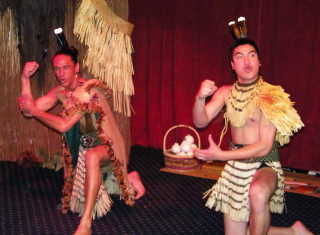 •	HAKA – these are dances with rhythmic movements and shouted words. 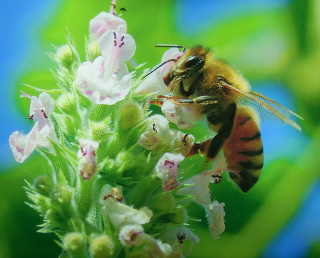 •	HE TOHO – is a cultural performance. •	POI – is a woman’s formation dance that involves singing and manipulating a ball of woven flax. •	New Zealand is located on a ring of fire – an arc that stretches along the edge of Asia to Alaska and along the coast of America. This ring is the border of the pacific plate and other plates that form the Earth’s crust. More than 75% of the world’s volcanoes are situated along this ring. It is where the plates meet, that energy is created and is released as geothermal activity. 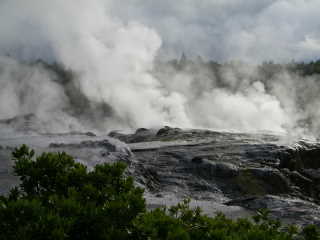 Geothermal fields such as Rotorua occur in areas where water is able to pass down through cracks in the rocks. 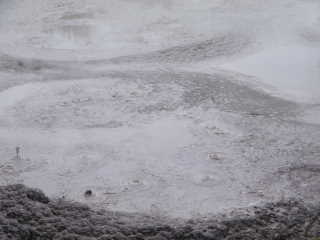 As the water gets closer to the geothermal activity, it heats and rises back up through the surface – and geysers and hot springs are formed. 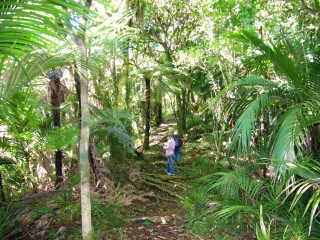 •	Auckland has 49 discrete volcanoes and this is referred to as the ‘Auckland Volcanic Field’. 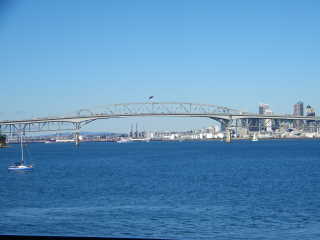 •	As it was opened in 1959, the Auckland Harbour Bridge has just celebrated its 50th anniversary. •	Wellington has developed its name in the film industry – ‘Wellywood’. The director of ‘Lord of the Rings’ and ‘King Kong’ – Peter Jackson, still calls Wellington his home. FACTOIDS: •	Christchurch is known as ‘The Garden City’ and is a place where Old English elegance and contemporary New Zealand living are entwined. •	Christchurch is home to a huge complex built for the administration of the New Zealand, US and Italian Antarctic programmes •	In January 1957, the first building of the Scott Base was built. 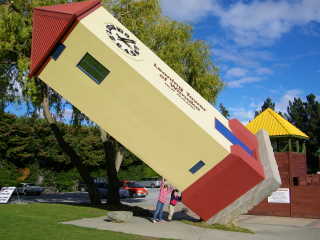 This was the first base built by New Zealand in Antarctica and the New Zealand flag was raised there. •	Antarctic Fish which live under the ice (in places such as McMurdo Sound), have very few blood cells so that the blood is very thick and flows better in the cold. The ‘Ice Fish’ is the only known vertebrate to have NO red blood cells. •	An Antarctic fish’s body temperature is the same as the water temperature minus 1.9 degrees C. Normally blood freezes at minus 1.1 degrees C, but Antarctic fish have an antifreeze chemical called glycoprotein in their blood. Their kidneys have also been adapted to conserve the antifreeze. •	The United Kingdom was one of the twelve nations that initialled the Antarctic Treaty in December 1959. 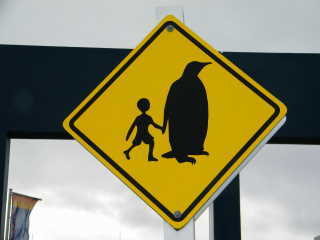 Today, the UK is a Consultative Party to the Treaty with 3 year –round research stations in Antarctica. •	The Colossal squid at Te Papa is 4.2 metres long and weighs nearly half a tonne! 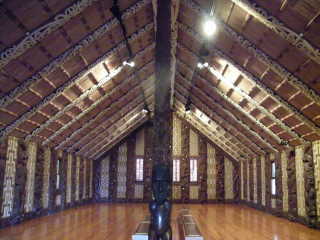 •	For Maori, the marae is a focal point for all groups and their kinship. Here, they can meet to discuss and debate, to celebrate, to welcome the living, and to farewell those who have passed on. 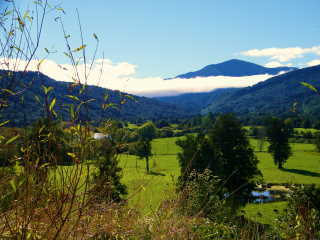 There are more than one thousand such places throughout New Zealand. •	The Boar War was 1899-1902. It was to be New Zealand’s first war under the British Empire. •	103,000 Kiwis went to the 1st world war. 18,500 died and 50,000 people were injured..... •	New Zealand has approximately 70 million Opossums (none of which we have witnessed alive) and it is said that they eat through a staggering 21,000 tonnes of foliage each night. This is creating an ecological nightmare for New Zealand and there are many control operations in progress throughout the country. 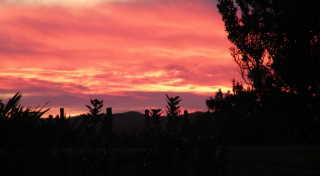 •	Gisborne is the first city in the world to see the sun rise each day. 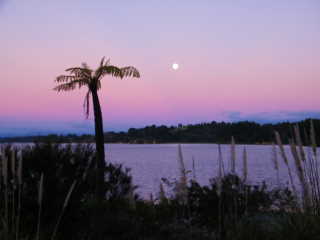 The Maori name for the district is Tairawhiti –which means “The coast upon which the sun shines across the water”. 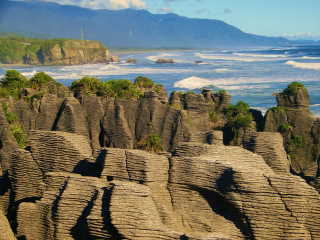 •	Gisborne is the first European landing place in New Zealand -Captain Cook sailed into what is now known as Poverty Bay in 1769. 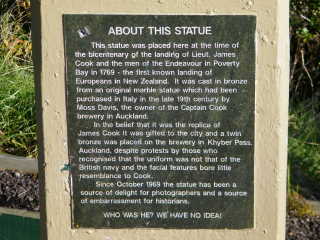 •	Gisborne also has an infamous lookout at Cook’s Plaza , with a ‘Captain Cook’ statue –only the man in question does not have a British Uniform –nor does he resemble Cook in any way........As the plaque embassasingly reads today “Who is he? – We have no idea! 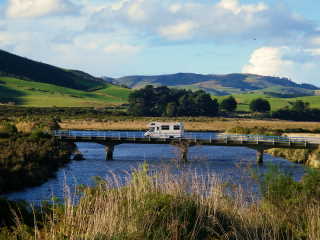 .........” •	The Large Region East and North East of Wellington is known as the Wairarapa, named after Lake Wairarapa (shimmering waters), a shallow but vast 8000 hectare lake. This region is a sheep-raising district and it boasts 3 million sheep within a 16 kilometre radius of Masterton (the region’s main town). FACTOIDS: •	Invercargill is New Zealand’s Southern most city and came into the spotlight as a location for ‘The world’s Fastest Indian’-the film abut Kiwi motorcycle legend Burt Munro. 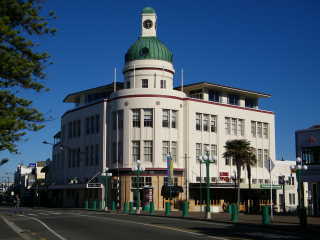 Invercargill has a strong Scottish Heritage and enjoys a reputation for its hospitality. •	On his first trip to the Bonneville Salt Flats in 1962, Burt Munro achieved a speed of 179 mph ... and in 1967 Burt claimed the World Record Class S-A 1000cc with an average speed of 183.586 mph (one way 190.07 mph) , and this record still stands to this day! 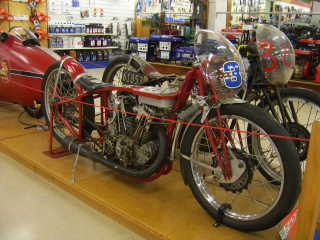 Burt’s achievements are the most remarkable that motorcycling has ever seen and he has created a legend...... •	The Southland Museum in Invercargill is designed in a very distinctive pyramid shape. Among other interesting displays, it is home to the largest public display of live Tuatara in the world. Henry, at over 100 years old, is the oldest! 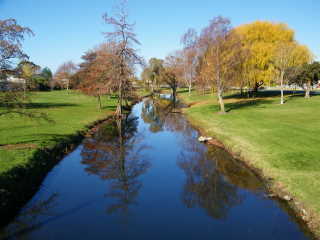 •	Queens Park is without doubt the grandest of all the Invercargill Parks. It covers 81 hectares (200 acres) and is now the jewel in the crown of the city’s reserves and is widely acclaimed throughout New Zealand. 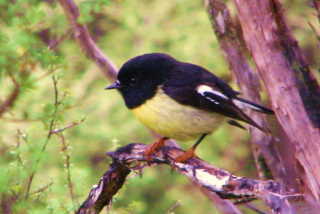 The aviaries were opened in 1998 with generous funding from the Community Trust of Southland. Here members of the public are able to view exotic and native bird species –close up. The park is also home to the rarest waterfowl in the world-the Campbell Island Teal. 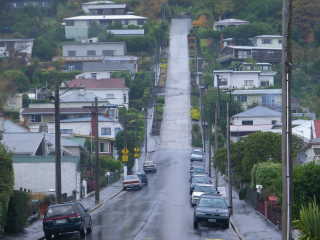 •	BLUFF – Where the journey begins.....is the oldest European town in New Zealand. 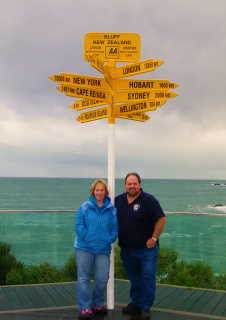 The Stirling Point International Signpost is at the beginning of State Highway One – at the Lands End of Bluff. 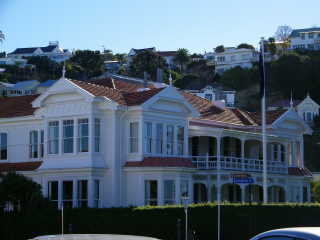 •	Dunedin was the winner of New Zealand’s most beautiful City Award in 2008. •	Dunedin is New Zealand’s largest city- by area and is widely regarded as the best preserved Victorian and Edwardian heritage city in the southern hemisphere. 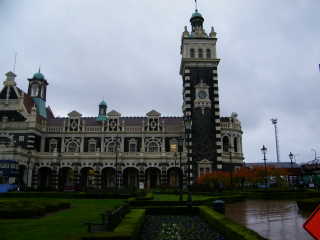 •	Dunedin Railway Station is said to be the most photographed building in New Zealand. 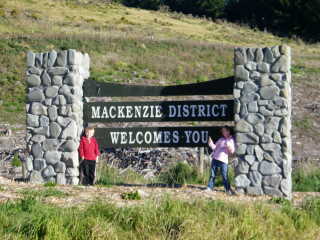 •	Almost one fifth of Dunedin’s population of 123,000 are students. 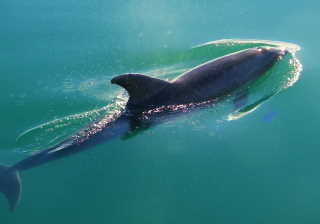 •	Internationally acclaimed environmentalist David Bellamy has described the Otago Peninsula (just by Dunedin) as the ‘finest example of eco-tourism in the world’. •	Maori legend says that the Moeraki boulders are food baskets that were washed ashore from the wreck of the ancestors’ canoe that made its epic voyage to New Zealand from Hawaiiki. 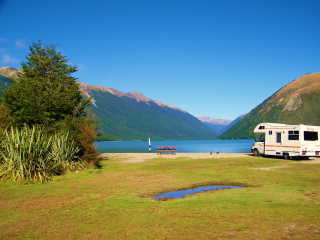 •	The sky above the Mackenzie High Country of New Zealand is renowned for its clarity and beauty. 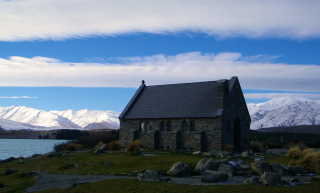 •	The Church of the Good Shepherd was built in 1935 to the ‘Glory of God’, as a memorial to the pioneers of the Mackenzie Country. •	Close to the Church of the Good Shepherd there is a bronze statue of the sheepdog, a tribute to the hardy dogs ‘ without the help of which the grazing of this mountain country would be impossible’. 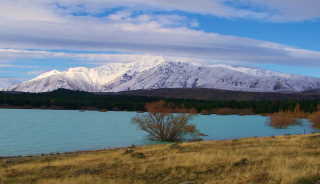 •	Lake Tekapo is still fed today from the remnants of ice age glaciers descending from the South Island’s Southern Alps. It is now the start of a massive hydro scheme which carries the water through an extensive system of upland canals and lakes generating electricity many times over on its journey to the Pacific Ocean hundreds of kilometres away. 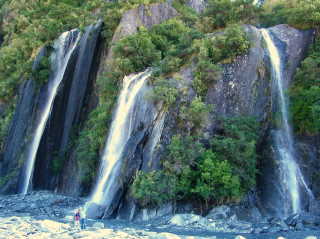 The region is the hydro powerhouse of New Zealand. 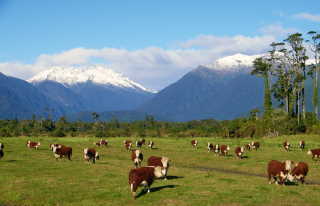 •	Named after James Mackenzie, a 19th century sheep rustler –Mackenzie Country lies in the shadow of Aoraki/Mt Cook and the giants of the Southern Alps. 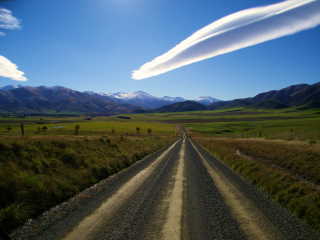 The Mackenzie country is staggering in its scale and grandeur. 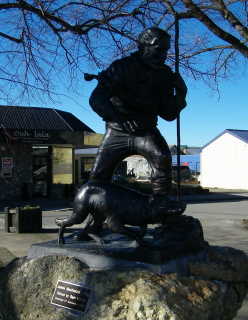 James Mackenzie and his dog are said to have stolen a mob of sheep from a South Canterbury run-holder in 1855 and driven them over the mountains to the Mackenzie Basin. He was the first known white man to enter the basin. When he was finally caught, other settlers realised the potential of the land and followed in his footsteps. His exploits in evading the authorities (and escaping arrest on a number of occasions!) led to his name being forever associated with the district. 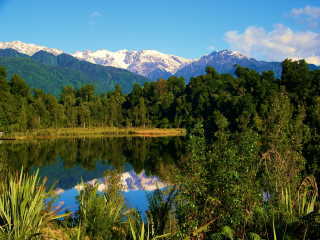 •	Mount Cook and Mount Tasman are New Zealand’s highest peaks. Just checking back in to say that the weather has brightened up and so have our spirits!! 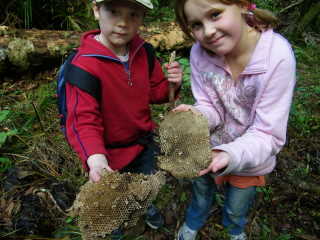 Some of our New Zealand photos will follow shortly! THANK-YOU FOR TAKING YOUR TIME TO CHECK BACK ON THE PROGRESS OF MACSWAYROUND! 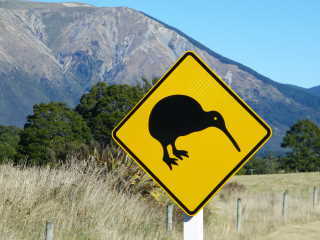 FACTOIDS: •	The National Icon of New Zealand is the Kiwi and the Fern is the National Emblem. 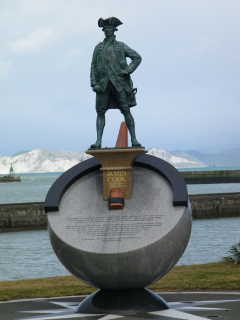 •	Captain Cook made his first New Zealand landfall in 1769. 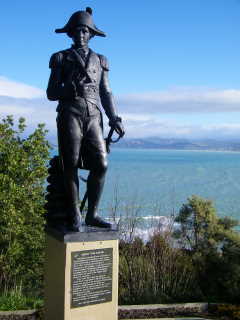 He stepped onto New Zealand soil at Kaiti Beach on 8th October 1769. •	In New Zealand you may be permitted to drive at the age of 15 (between the hours of 6am and 10pm) •	In New Zealand you must be 18 to buy alcohol from the whole -salers, a pub or a night club, but you must be 25 years old to by alcohol in a Supermarket. 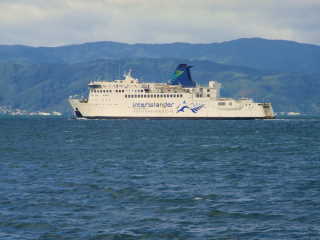 •	Wellington is only the third largest city in New Zealand but retains its status as the capital City. 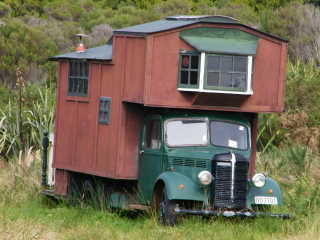 (Many people assume Auckland is the capital, as it is much larger). •	Per Capita, the City of Wellington boasts more Cafe’s than New York City! 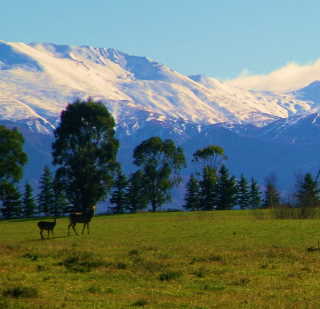 •	South Island has an area of - 151,000 square kilometres, a population of 947,500 people and a temperate climate with snow in the mountain regions. 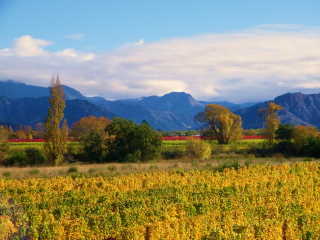 •	Blenheim is the best place to access New Zealand’s biggest wine-growing district. 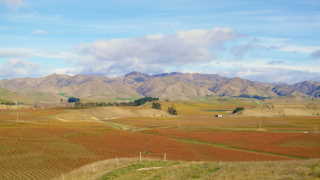 •	Blenheim is one of the sunniest towns in New Zealand, boasting an estimated average of 2438 hours of sunshine a year! (we will let you know about that later!) •	Murchison was founded on man’s hunger for gold and for land, while the forces of nature contributed to dramatic ranges and deep fast flowing rivers. •	The early Maori knew Franz Josef as Ka Roimata OHine Hukatere – Tears of the Avalanche girl. 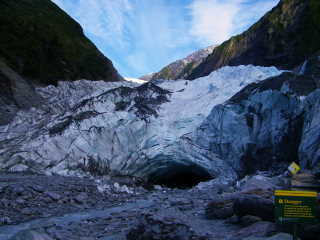 •	The Fox’s Glacier has a depth of up to 350 metres. 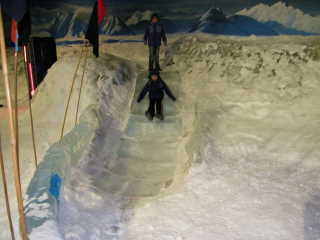 The glacier terminates at 250 metres above sea level. 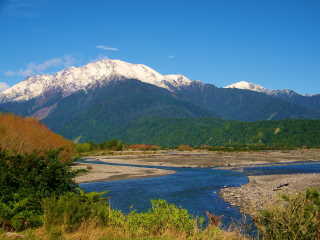 It has 35-45 metres of snow fall per year. 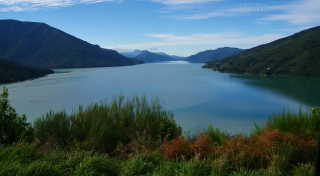 •	New Zealand’s fourth largest lake, Lake Wanaka, sparkles on the edge of the town. •	The beautiful resort on the shores of Lake Wanaka is the gateway to Mount Aspiring National Park, a World Heritage Area containing magnificent mountains, glaciers and lakes. •	Queenstown has a well deserved reputation as the country’s Adventure Capital – White-Water Rafting, Sledging, Tandem, Parapenting, Flight Seeing, River Surfing, Canyoning, Heli-Skiing, Jet Boating and Bungy Jumping – to name but a few!! 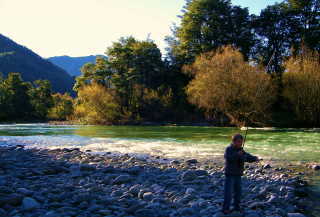 •	The “Shot-Over River in the Queenstown District is the second highest Gold –Bearing River in history, second only to the Klondike River in Northwest Canada. Gold was found in 1862 and the river was so lucrative it yielded a record breaking 57.6 kgs of gold in just one day! The river yielded 12 oz of gold per yard of gravel. •	The Remarkables Mountain Range (2343 m), around Queenstown is one of only two mountain ranges in the world that run truly North-South. The other mountain range is the Rockies. 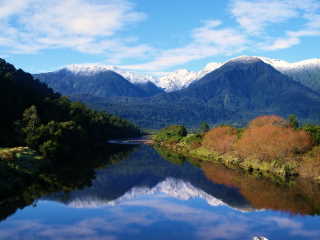 •	With the Main divide of the Southern Alps at its backbone, the Whataroa Valley is the spectacular gateway to New Zealand’s most outstanding scenery. •	The Tui is one of New Zealand’s Song Birds. •	The Kereru New Zealand Pigeon is the world’s second largest Pigeon. •	The Black Stilt is the Rarest Wading Bird in the World. •	The Kea is a cheeky parrot that lives high in the mountains of the south island. They have a reputation for eating the rubber from hiking boots! •	The Tuatara is a living dinosaur and has been here for 235 million years. Despite having a lizard-like appearance, the Tuatara has such different skeletal features that it belongs to an order of ancient reptiles all to itself. 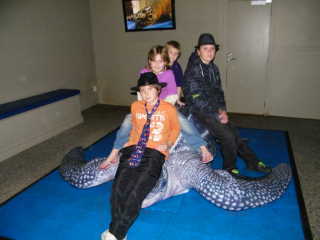 Today these reptiles are only found in New Zealand. The Tuatara does not like temperatures in excess of 28 degrees Celsius and have the ability to hibernate if the temperature drops below 5 degrees Celsius. On top of a Tuatara skull is a third eye. This is a complex organ which actually has a lens and a retina. It may be visible for the first 6 months of life and then gets covered over with opaque scales. 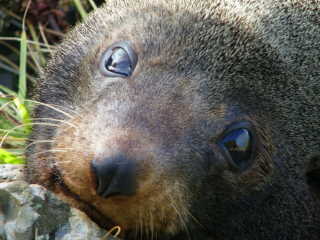 This eye is thought to act as a pineal gland to detect seasonal changes by sensing the length of daylight and darkness. •	The female Kiwi can lay an egg which weighs up to 20% of her own body weight! This is the highest proportion of any bird. To put that into perspective it would be a similar experience to a woman producing a 37 lb baby!! The average Kiwi egg weighs about 450 grams (which is a similar weight to 6 hen’s eggs).